For 15 years, Erin and I carted around a two-piece copper-in-wood planter set, but never had the space or place to put it together, or the money to stock it with orchids and jade and other exotic plants. We’d bought it from a cousin, thinking it would work great in the sun room of our Shaker Square apartment, but then we moved to North Carolina, lived in a series of smaller apartments, and got too busy to worry about a bit of wood and metal. Finally, a few weeks ago, looking into the garage where the planter was collecting spider webs, we decided to put it to use on the back patio, sans copper. I drilled a few holes, assembled it on the deck, and filled it with soil. Erin and the girls planted basil and dill seedlings, and also tomatillo and tomato plants that we’ve since moved to a small bed in the backyard. 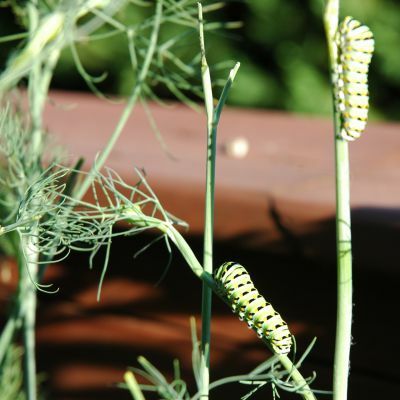 The dill we used last month for grilled salmon with cucumber-dill sauce, and it’s gone to seed and collected a trio of monarch caterpillars. The basil is full on, and with this pest recipe from Saveur has provided a few tasty meals this week. As I washed the dishes tonight, the sweet aroma of the leftover basil leaves reminded me of the good fortune we had on Paama. I had exited the classroom of Vaum Junior Secondary School one morning, and amid the tropical smells of the island, I caught a familiar scent and took notice of the shrubs lining the building (painted in light blue to reflect the donations of the European Union that had allowed the recent construction of the school — my dad’s crowning achievement during his Peace Corps service was building a school, but we arrived to one just built). Basil! For the next year, I’d regularly walk over in the afternoon to snip a few leaves, which Erin added to a simple but tasty sauce for our pasta.